Now it is at this point that the Scene started building for me, and I was never embarrassed that much in my life. It started with my reply— “Sir my birthday falls on second day of Rakhi!! !” It was all I knew about my birthday. Our family used to celebrate it as per Hindu Calender and tithi which everytime used to fall on second day of Rakhi (another Hindu Festival widely celebrated in North India). Though I could not see the facial expression of Mr. Sharp as the world was blurred at that distance for me (Oh yes I used to think it is same for everybody)But I was able to feel something stupid about myself when I saw the surprised expression of my classmate sitting next to me. Then I heard Mr. Sharp’s voice- “I want date of birth dear as per English calender, I am not concerned when you celebrate it”. While sounds of murmur were growing louder in class, I reiterate it again -”Sir it is 1979 as per my age, but it always fall on second day of Rakhi”. I heard his voice again- “Dear this is a serious matter about birth date, and do not calculate it like “Id ka chand”. Whole class burst into laughter, and I was really ashamed that day of the way my parents were celebrating my birthday. I also realized later that day that it was my birthday only which falls on different dates every year, but all other class mates were celebrating it on same day every year. It also gave me an impression of something unscientific we were doing in our family by taking reference of Rakhi and not English Calender Dates which whole world was following. Friends – This is a real incident of my life, As Indian New Year is also coming and I wanted to share Hindu way of calculating date and time as per ancient Indian Calender started in the name of King Vikramaditya, This incident came to my mind. It is our ignorance towards the culture that many times make as ashamed of our own roots, which happened to be much more scientific , how , I will tell.. Read on…. Indian Calender System (Vedic Time Keeping)also termed as Hindu Calender System is the one started in the name of famous Emperor Vikramaditya of Ujjain 57 years before Christ when he got victory over Sakas. Hence if we add 57 to current Gregorian Calender we will arrive at Indian Calender Year ie Vikram Samvat 2076. This year the Hindu new year is starting on 6th April 2019- Indian Tithi for same is Chaitra Shukla Pratipada. Which means first day of Shukla Paksha in Chaitra Maas. More clearly it means – first day of waxing moon in the month which marks Chitra Nakshatra (Name of Constellation on full moon day. We will get into it in detail later in the article. Now this is the time when astronomically Sun crosses from southern hemisphere to northern hemisphere and intersects the celestial equator and ecliptic. Sun enters the Aries Rashi (Zodiac Sign). This is the day which also marks the first day of Navratri followed by celebration of Ram Navami. If it is Shukla Paksha last day of month will be Full Moon and hence tithi will be Purnima, where as if it is Krishna Paksha, last day of the month will be New Moon and hence tithi will be Amavasya. As the days are calculated based on the actual longitudinal angular difference between the respective positions of the moon and the sun. It is common to see that the tithis vary in length, some shorter than our regular 24 hours, some extending beyond, and this leads to certain auspicious days being celebrated across 2 days of our Gregorian Calendar. A typical day in Hindu Calender System is called ‘Ahoratri” which means day and night taken together. Taking Ho for day and Ra for night another word is coined as HORA. English word originated by following it is HOUR. There are 24 HORAS in one full day and night. This is something which is straight away followed as it is in Gregorian Calender as well. But why the sequence of days is like that, is explained only in Indian Calender System as per Vikram samvat. Lets understand that. शनि Shani also called Saturn takes approx 30 years in revolution. ब्रहस्पति Brihaspati also called Jupiter takes approx 12 years in revolution. मंगल Mangal also called Mars takes approx 686 days in revolution of sun. पृथ्वी /सूर्य Earth/Sun : Earth takes 365 days approx in revolution of sun. Considering the relative motion of earth and sun, Vedic Astrology counts Sun सूर्य as next planet for time keeping purpose. शुक्र Shukra also called Venus takes 224 days approx for its revolution around the Sun. बुध Budh also called Mercury takes approx 87 days for its revolution around the Sun. चन्द्र Chandra also called Moon takes approx 27 days. Now taking 24 HORAS in a day, first Hora is always considered of Sun सूर्य /रवि , as it was visible first of all in the beginning of the creation. First day , therefore is Sunday रविवार . In the order as given above second HORA is considered of Shukra/शुक्र ,third HORA of Budh/बुध , fourth HORA of chandra/चन्द्र, fifth HORA of again shani/शनि and so on. In this way 24th HORA is of बुध /budh, and next day starts with first HORA which happens to be chandra/चन्द्र or Som, thereofre it is called somvar or Monday. In this way referring to the below HORA chart , you will find how other days of the week are also named after the first HORA that falls on that day in the order as given above. Therefore names of the days of a week necessarily in that order is Sunday, Monday, Tuesday, Wednesday, Thursday, Friday & Saturday!!! With this terminology the Rishis can exactly figure out the location of a planet in the sky with the name of the nakshatra. 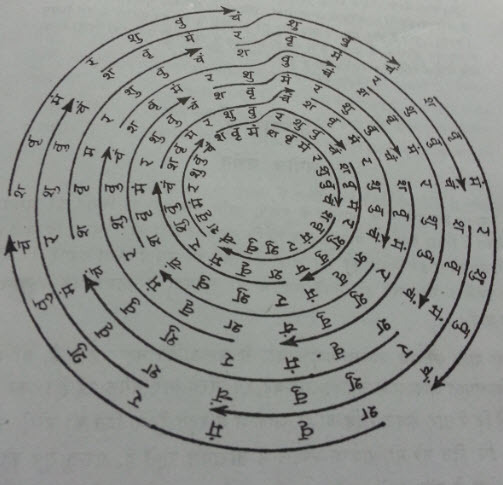 Not only this, the nakshatras are further divided into four charanas giving us total of 108 charanas in sky. This enables us to exactly pin point the planetary position in the sky as in which charanas of which nakshatra it is into. Not to be missed here the importance of 108 number in Hinduism. Well now every month purnima (ie Full Moon, by now you must be familiar with this terminology) Whatever Nakshatra is there in the sky, month is named after that Nakshatra. 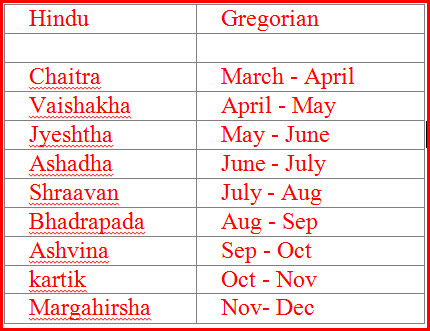 That Names of the month correspond to the particular nakshatra on the full moon day. For example it will be Chitra Nakshatra on full moon day ie 22nd April, the name of Month therefore is Chaitra. Tithi therefore on 22nd April will be Chaitra Purnima. Hence when we take the name of a month in Hindi we also know the position of Stars Constellation is the sky at the same time. And when we go deep into the tithi of that month, we are even aware of position of moon phase. There can be no better way to name a month or a date than this one . Now comes the real and best part , with all the facts stated above in this article , I can understand that as a 10 years old kid when I used to celebrate my Birthday as per Hindi Tithi, it was not my birth date which used to fall on a different day every year, but it was their birth dates who celebrated it as per English Calender which used to fall on a different day every year. As I know now that if this year my birthday is on Chaitra Purnima then every year it will be the same day with similar position of stars, moon its phase etc. It will always be Purnima (Full Moon), with Chitra Nakshatra (Chitra Constellation) in the sky. Where as 1st January will be different every year. It is not really same day of the year in astronomical terms. This year Hindu New year is falling on 6th April ie Chaitra Shukla Paksha Pratipada. It is a request to all celebrate it with full zeal, bliss and excitement, as it will be a real new year also marking change in Climatic conditions in India with many festivals across the country such as -Gudi Padwa, Ugadi and Navratri. On this day Sun enters Mesh (Aries) Rashi and spring season commences. It is also said that on this very day Lord Brahma created Universe and Satyug began marking of commencement of the New Year. Therefore to conclude – Happy New Year to EveryBody for Chaitra Shukla Pratipada..
Only astrologers and astronomers new this and common men remained aloof of such knowledge. 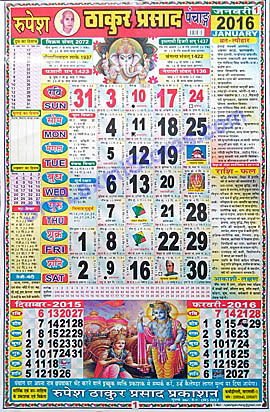 In India every body is expected to know all about Indian calender. This article makes the job easy for all. Every body must read this and such matters.